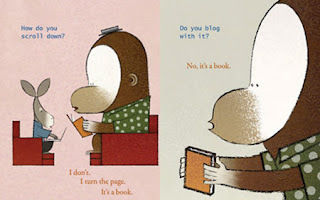 Summary: Playful and lighthearted with a subversive twist that is signature Lane Smith, It’s a Book is a delightful manifesto on behalf of print in the digital age. This satisfying, perfectly executed picture book has something to say to readers of all stripes and all ages. My review: I read Lane Smith's It's a Book to my six-year old son and his smile never wavered until the end when he wanted to hear it all over again. That's the proof that a picture book is good. The story is about a monkey trying to read a book while a donkey, with his laptop on his knees, wonders what has his companion so captivated. Donkey then begins to ask questions about this mysterious marvel Gorilla has and Gorilla, always patient, answers him. His Mouse buddy, conveniently hidden under Gorilla's cap, makes an appearance twice and both times steals the story. By the end Donkey has become a book fan. The illustrations, also by Lane, truly make the story come alive and are so adorable. I found It's a Book charming, cute and funny. I understand some readers are offended by the very last word used in this book which pertains to the type of animal being addressed. Sometimes we forget children's book writers create their works with their broad audience in mind: not only the children but their siblings, parents and grandparents who read to them.This last word was meant to make everyone, especially the older readers, chuckle. The story itself may seem simple but its message is powerful. In this age of technology with so many gadgets battling for our attention, it is amazing the power of the written word can make some sit and read. No matter what is created and sold to us reading an actual book--any type, whatever the age--will never go out of style. I believe the sheer amount of book bloggers out here can attest to that too. If you're not offended by one word this picture book is definitely worth checking out. Loved this one! It was one of my top 10 favorite books (not just picture books, but books in general) of 2010. I stumbled across your delightful blog today. Great review. I'm collecting books for my grandbaby who will be arriving in February. You're never too young to hear a story, right? Happy New year ladies! Yes, Beth S, we loved it too. And we agree with Cozy in Texas babies can be read stories too!